What is the best way to teach writing? 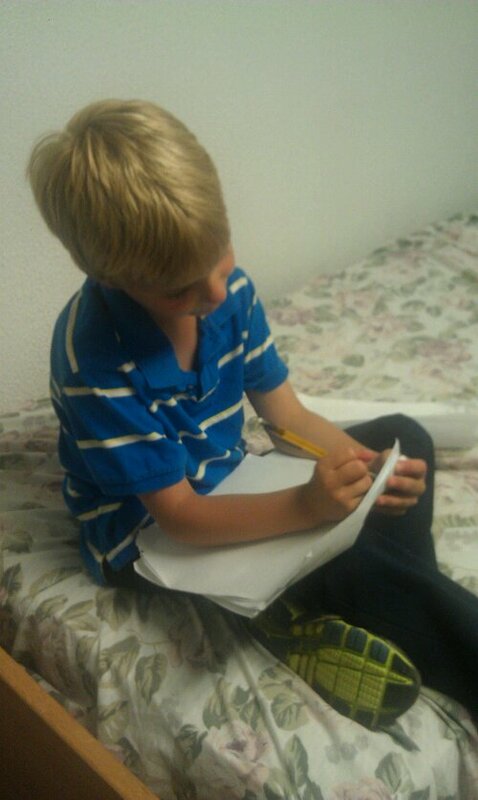 Wesley enjoys writing, even on vacation. Teaching writing intimidates many homeschool parents. However, it doesn’t have to be complicated. There are some good writing curricula available, which make good tools. But the approach I use works whether or not you supplement with a published curriculum. What do you think is the single-most-important factor in becoming a successful writer? Practicing? Grammar instruction? No. The most important part of the writing curriculum doesn’t require a pencil or keyboard. The best way to become a proficient writer is to read. A lot. Voraciously, even. Read a balance of fiction and non-fiction. Read a variety of genres. Reading well written literature and high quality non-fiction exposes the writer to proper grammar, spelling, and conventions, as well as to the author’s craft. I encourage students to read both fiction and non-fiction daily. Students also should practice writing each day. They need to write about a variety of topics, including things of interest to them, experiences they’ve had, books they’ve read, their opinions, their hopes and dreams, their frustrations, their fears, how to do things, and anything else that comes to mind. I start by brainstorming a list of things with them. They keep the list and refer to it when they need an idea. I also provide a list of writing prompts they can use. Some days I let them pick what to write about. Other days I tell them the topic. I require them to write a certain amount (for example, a 4-sentence paragraph) and for a certain amount of time (for example, ten minutes). They must meet both minimums. In the example I gave, the student would need to write at least 4 sentences and she would need to write for at least ten minutes. I increase the requirement as skills and stamina develop. Research shows that students need at least 45 minutes of writing instruction and practice daily to make significant gains. I generally pick a certain skill or technique that the student needs to improve. I teach him that skill and give him some practice. A curriculum would work for this, but there are other options. The Internet has lots of interactive and printable resources, many of which are free. Or you can create your own exercises. Then I have the student write about the selected topic, being careful to apply the targeted skill. After she finishes, she needs to reread the piece to check to see if she correctly applied the skill. She should underline anything she notices that needs correcting, and make the corrections above the original writing. (It’s a good idea to write on every other line for this purpose.) Underlining, rather than erasing, helps the writer to be reflective and to see growth over time. It also helps you to see how your student has grown. It’s a good idea to have your child keep all of the writing in a binder so you can see the chronology of skills developed through the year. This also can serve as documentation of homeschool progress in Language Arts in many states. Twice a week I suggest selecting one piece of writing to proofread. I don’t advise you to correct your child’s writing everyday, as this may take some of the joy out of writing. Look over the selected piece, specifically looking at the current skill being taught and any others you have taught. Make corrections to those skills, but not to everything. You don’t want to exasperate your child as a writer. After you have made suggestions and corrections, return the piece and require that it be rewritten. Making the necessary corrections will help your student to learn the targeted skills. When teaching writing, remember that the goal isn’t perfection, but growth. I have been writing seriously for about 25 years and have had a career in journalism, but my writing still isn’t perfect. If your child practices these techniques–reading fiction and nonfiction daily, writing daily, self-editing daily, and making your suggested corrections twice weekly–you are likely to see him steadily grow into a successful writer.